I remember quite a few people built this kind of toboggan, probably 1948, 1945…It’s not easy to make this kind... It’s really hard! The original Athabascan toboggans were made of moose hide, and were pulled by hand. European fur traders introduced dog teams as well as this type of wooden sleigh where the planks curl back in a curve at the front. Large, dog-drawn Athabascan toboggans of this type – often with sideboards made of stretched moose hide – were used to haul heavy loads of people, food, and freight. The maker of this model was probably Deg Hit’an. Eliza Jones: “Model of Toboggan.” Oh, Kkaayeh hut’aane [people of the Kaiyuh Slough]. Kkaayeh hut’aane is across from Nulato, south of Nulato, that whole area down there [floodplains south of the Yukon River between Kaltag and Nulato]. Eliza Jones: This word is normally pronounced the Anglicized way, Kaiyuh. . . . I never saw one like this. The ones I’ve seen are made different. . . So this is a model, and it looks like they used babiche(2) to tie these cross pieces down. And these strings along the side too I think look like babiche. And I don’t know if this is the tying place – seems like it would have been lower – but there’s a loop up here on top. The toboggans I know were made different, but I’ll talk about it after Trimble. . . .
Trimble Gilbert: Well, I never seen like this, but then I remember quite a few people built this kind of toboggan, probably 1948, ‘45. I remember they keep doing that. And ‘55 or ‘56 my father-in-law sent me little one like this that’s got moose skin hide on both side and the handlebar. I don’t know what area they been using this and know nothing on it. And lot of people using babiche here after they bent it. I seen it happen like this in the past. . . . And they usually cover this [curved end] with moose skin too, or any kind of skin, caribou skin. . . . And then they paint it with something. 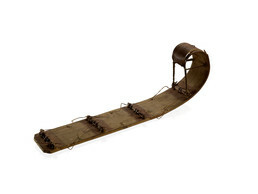 It looks better that way.. . . It’s not easy to make this kind of toboggan [laughs]. It’s really hard! Other kind is easy, but this kind is really hard to make. But they know how to do it, so it’s easy for them I think. Takes a lot of practice. Eliza Jones: It seems like, from what I’ve heard, that people were admired for making really nice sleds like that. Judy Woods: They had those long ropes to put canvas in that with, for load. Eliza Jones: Okay, so they put canvas inside? Judy Woods: Yes, and put load in that. Eliza Jones: And then these loops would go up. Judy Woods: Mm-hmm, and they tie it. Eliza Jones: Yes, and then they would run a rope. Judy Woods: Mm-hmm, to tie that stuff down. Eliza Jones: Do you have a special name for that? Eliza Jones: I don’t know what’s the name of it. Only word I know is hutl [sled] and then toboggan. Judy Woods: Yukon sled, they call them. Eliza Jones: Yukon sled, yes. . . . The other Yukon sled that I’ve seen are made like those big sleds . . . made like a regular sled but really long. But it doesn’t have the basket on there so that you can put other stuff just besides, and they use that for hauling wood. 2. Babiche – a strip or strips of rawhide, sinew or gut used for sewing, lacing or fastening—is a word adapted from Canadian French and originally from Algonquian. Among the Athabascans, it is usually made from untanned caribou hide.